Medieval Village, house, garden and terraces. Special offer, last 2 weeks Aug.
Perched high, this typical village house, extends over four levels overlooking the medieval heart and away towards the distant Pyrenees. Maison du Midi is an ideal base from which to explore and enjoy southwestern France, and even Catalan Spain. Fronting onto the main village thoroughfare and backing onto the medieval lanes, it is a short walk from all the amenities in this unusually bustling French village — a choice of restaurants, bars, boulangerie, general supplies, post office, etc. 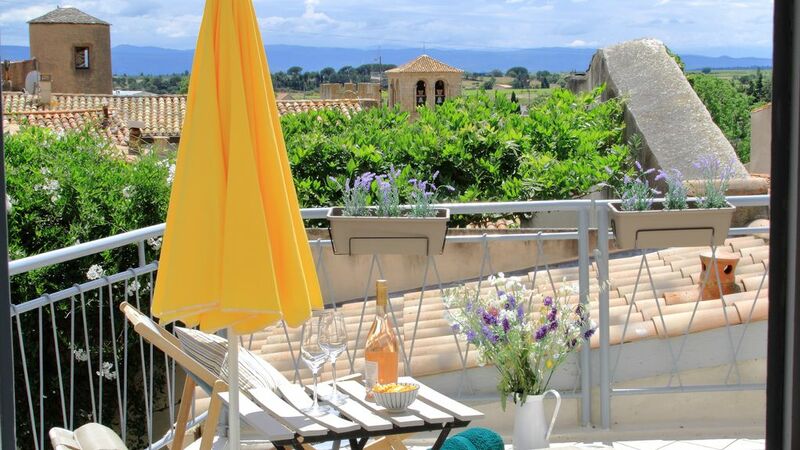 Caunes Minervois, clustered around the ancient Abbey that houses the tourist office and is the venue for open-air concerts and jazz nights, is situated on the edge of the Minervois vineyards and up against the Black Mountains. It invites a range of activities: wine-tasting tours; walking in the mountain foothills, through the vineyards or along the Canal du Midi; cycling; driving excursions across the Minervois plain to Narbonne plage and the Mediterranean coast, into ancient bastide villages and up to the many Cathar castles, to the Black Mountain caves, ravines and grottoes or to the swimming lakes and rivers both in the mountains and the plain (Lac du Jouarres in Homps, just 15 minutes away, or the similarly close-by new aquatic centre). The world heritage site of ancient Carcassonne, La Cité, is 20 minutes drive. Catalan Spain is just two hours away, either over the Pyrenees or along the coast. Salvador Dali’s house and museum are popular destinations, as is Barcelona. Many good restaurants can be found throughout the region, a remarkably good selection in Caunes itself, just a few minutes’ walk from the house. Market days occur in all the villages, as well as in very large produce market in Carcassonne on Saturdays ( also Tuesdays and Thursday), in addition ‘vide greniers’, or flea markets, can be found in one of the local villages most weekends. A variety of ‘spaces’ around the house have been created to cater for outside living from day-long full sun (the sun terrace), partial shade (the kitchen terrace and courtyard garden) to full shade (next to the barbecue beneath the kitchen terrace). Bathroom (level 4) with sink, toilet and bath/shower. A wall heater, mirrored wall and power point & hair dryer (incl). Wetroom (level 2) with sink, toilet and shower. A wall heater and heated towel rack. Full linen provided including towels, sheets, pillow cases, duvet, duvet covers & throws. One set per week. Beach towels are available by request. Comfortable living area with UK & French TV - seating for 6, small speaker available for listening to music etc. Also additional reception room at entrance with library (books available). one in kitchen and one downstairs in the "cave"
selection of coffee makers - cafetieres, drip coffee machine, italian espresso pots (for use on hob). very well equipped with everything you need for comfortable home dining. Notes on accommodation: Suitable for a family or friends sharing - 2 rooms with double beds and one with twin beds. Please note: there is a strict no smoking policy inside the house. As a consideration to other guests, no pets are allowed. Outside: A courtyard garden is accessed directly from the street (using side gate and alley), or from either the "cave" or steps down from the kitchen terrace. A large, built-in barbecue is adjacent to the steps down from the kitchen terrace. A sun terrace with fine views across the village to the Pyrenees. Utility Room: Front room (street level) contains work desks, washing machine, library & arm chairs. "Cave", below kitchen contains deep freeze & 2nd fridge. Cleaning / Towels / Linen / Maid service: The house is cleaned prior to all arrivals. All towels and linen are provided, and are changed and cleaned weekly. Other: The "cave" is an old wine cellar under the kitchen, with 'pierre-apparent' walls and massive stone slab ceiling, converted to a cool room (with deep freeze) with french doors into courtyard, garden, BBQ & lower dining area. Our favorite place to be was on the upper terrace with a view of the abbey. So many nights we were star gazing up there. We spotted so many meteors and a few satellites. Your house was a delight, everything we needed. The front bedroom was a bit noisy, but it is harvest time and the grapes must get picked and delivered. We were very thankful for the wash machine, clothes line and pens, as my sister's luggage was lost for 7 days. A huge thank you for helping us with our medical situation. Dr. Francisco was marvelous. One of the waitresses at Table d' Èmilie, (I think she cleans for you) spoke highly of Dr. Francisco. And by the way, what a wonderful restaurant. Thank you for your hospitality, that bottle of wine on arrival was a perfect touch to put us in French mode. We loved the experience of living in an older home in the heart of a medieval village. Hanging out at La Grande Fontaine became a ritual for us, eventually we were enamored to meet a couple of the regulars. I didn't find out until late in our visit that the donkeys I spotted were actually in a sanctuary and could be adopted. How wonderful! I am rather fond of donkeys. a patisserie, wonderful hiking and walking paths, and all the wonderful dogs hanging out at the Fountain. It's a magical place and we truly enjoyed a comfortable home to come back to every night. comments about your stay in Caunes Minervois. I am very pleased that you had a great time and enjoyed staying in our house. We love going to Caunes also. It is a lively village and as you say has this wonderful restaurant and other amenities. Well equipped charming house in great location. This was our second stay in this charming French village house. The house is fully equipped with everything you need for a self catering holiday, especially the electric fans in all of the rooms as the week was exceptionally hot for the time of year. The outside balcony on the first floor is ideal for sunbathing and the patio on the ground floor is ideal for enjoying al fresco meals under the shade of the foliage canopy. There is a well stocked bookcase with numerous guides to the area and a good selection of board games. On the down side I had a injury to my knee which made the narrow steep stone stairs to the first and second floors a challenge. The village of Caune is ideally placed to explore the Minervois and Corbieres regions. The Mediterranean coast, the cities of Narbonne and Beziers are within easy driving distance. For a small village there is a good selection of eating places and numerous vine yards offering "degustation" of their produce. We hope we will have the pleasure of staying here again. Thank you Daniel for coming back to stay in our house and I am very pleased you had a great time. Do come back again and your knee won't be so troublesome next time. At the first glance from the street you might be disappointed. But indeed it is a very personal and charming house, well equipped and well maintained. We loved the light and airy kitchen (fine to cook in company, drinking a nice glass of wine) and the adjoining terrace. The bedrooms are upstairs (1st and 2nd floor), spacious and friendly. From 1st floor bedroom there is a terrace overlooking the town and landscape. The house is perfect for friends and families - but children must be big enough to safely master steps and stairs. We were there one week for a cycling holiday - it's a very good region for bike excursions to the nearby hills and mountains with really beautiful landscapes. The village has a bakery, small supermarket and butcher and several restaurants and bars - you need not move the car if you don't want to. Overall we liked the house and our stay there and can honestly recommend it. I am so happy that you and your friends enjoyed your stay at our house. There are a lot of stairs and I hope we make that quite clear on the website. Wonderful property with a fabulous outdoor space! This is a great property for families and friends to get together, the kitchen and outside deck area works really well for warm sunny evenings. The bedrooms are all very well equipped and a great size, so no need to fight over who gets the bigger room! The design and decor of the home compliments the area too, so you get a real feel for the place! gorgeous village and property, nice to have lots of outdoor space that is so provate in the heart of a village, lovely courtyard and sunbathing area. Outdoor dining areas both useful as well and nice to have the bbq. v well equipped and well placed for all sightseeing and winery trips. comfy beds, large bedrooms & bathrooms. Nice to have good wifi and UK tv as well just in case! Beach equipment all provided for you was a nice touch as well as the welcome bottle of wine. also plenty of storage space for fridge /freezer with the extra downstairs - v useful for a full house. hikes from the village were all worth doing - we did a few ranging from 17km to Citou and back on the forest paths, to 10km past the church to just shorter walks in the vineyards around the village. V good restaurants in Caunes compared to other small french villages we have stayed, nice wine bar too and nice to have all the local shops and amenities within a few minutes walk of the house. An interesting property in a pretty town. We enjoyed our stay in the house in Caunes. It was clean, well kitted out with everything and more than we needed. Multiple fans were useful in the hot weather and there were plenty of books, games, tvs wifi should the weather be poor. The house had a homely feel and and the quirky lay out on different levels added character. The kitchen was well supplied with crockery and cutlery and there were cooking facilities if needed. Upstairs and downstairs bathrooms were useful and added to the feeling of there being everything that you need. The outside space, whilst limited, provided eating space and relaxing space. It would be better for relaxing if the sun terrace had a better shade facility as the umbrella was broken and was not safe in the windy conditions. The only other problem was the lack of a parking space and it was first come first served on the busy road. Caunes is an interesting town with a variety of local shops, artisans and good local restaurants. A good place to wander round. In the gardens of the Abbey at the centre of the village concerts (both a classical season in July/August and more popular events) are staged weekly in the summer. The village hosts an annual marble sculpting competition as well as a variety of craft classes at various times. The foothills of the Montagne Noir begin behind the village and provide walking, hiking, bird watching and rock climbing opportunities. The extensive vineyards of the Minervois, and the Canal du Midi that runs through them, provide excellent walking and cycling opportunities. The Mediterranean coast is 40 minutes drive away, and the adjacent village, Peyriac (5 kms), has a new public swimming pool. Just 20 minutes away, the Lac de Jouarres near the village of Homps has been developed for swimming, picnicking, etc. Swimming from the man-made beach on the Lac de Cavayere in Carcassonne is also popular in the summer. Carcassonne and the World Heritage site of the old walled city is 20 minutes by car. A wealth of interesting villages, such as the Cathar stronghold of Minerve, are about 30 mins drive away, and to the south a variety of ruined Cathar castles can be visited en route to the Pyrenees. Barcelona is 2-3 hours drive from Caunes. Five minutes walk away Marlene's shop has a amazing selection of foodstuffs including a bakery. Caunes offers another bakery, a small supermarket (including a butcher's shop), a bank, a cafe-bar, several delightful restaurants, a pizzeria and a hotel with a restaurant. In addition, there are many outlets for the local wines, art galleries, and a post office. Parking is in the street across from the house, or in an off-street carpark (5 mins walk). Changeover Day: Saturday is the usual changeover day, but other days can be agreed by prior arrangement. Check-in time is 4pm and check-out time is 10am. However, if these times are inconvenient, we will be happy to store luggage for you by prior agreement. Notes on prices: All local taxes, including the tourist tax, Taxe de Sejour, is included in the booking cost.